Toyota and Lexus supply the excitement | What Car? It's not all electric cars at the Tokyo show this year. Toyota and Lexus broke ranks with the majority of manufacturers by revealing exciting petrol-powered coupes that are less than two years away from production. Lexus finally confirmed that the LFA supercar that it has been touting in concept car form for years will go on sale in 2011. Before you go rushing off to the dealer, though, you might want to take a reality check. It will set you back 340,000, which is why just 500 will be built. Still not put off? Then Lexus will be happy to take your order now, and assembly will begin late next year. It's expected that about 15 will come to the UK, and two 'serious orders' have already been placed. 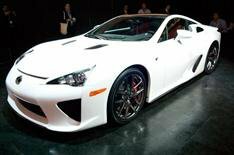 The LFA is a front-engined, rear-drive two-seater powered by a new 4.8-litre V10 developing more than 550bhp. A carbonfibre-reinforced plastic passenger cell helps keep weight down to less than 1.5 tonnes. The top speed is quoted at more than 200mph. On a more down-to-earth level, Toyota will be back in the coupe business towards the end of 2011 with a car based on the FT-86 concept on show in Tokyo. It was jointly developed with Subaru, which is partly owned by Toyota. A Subaru version is also expected, though it has yet to be announced. Subaru will build the car for Toyota using one of its flat-four 'boxer' engines most likely the new fuel-efficient 2.0-litre direct-injection turbo unit. The FT-86 is compact at a little over four metres long and is said to be light. In contrast with all other Toyotas on sale in the UK, it will be rear-wheel drive. The cabin seats four. The '86' part of the concept car's name has legendary status in Japan, similar to RS or GTI in the UK. It was the badge given to the car that was known as the Corolla GT over here, a model that is still revered in its homeland.